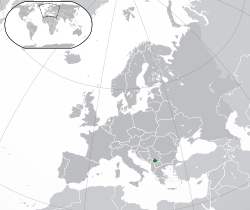 Location an extent o Kosovo in Europe. 2014 estimate. A new estimate haes been addit in order tae gie a mair correct GDP per capita. Preliminar results o 2011 census, that excludit fower northren Serb-majority municipalities whaur it coud nae be cairied oot. Adoptit unilaterally; Kosovo is nae a formal member o the eurozone. Assigned 15 December 2016 tae Kosovo bi ITU. +381 wis previously uised for fixed lines. Kosovo-licensed mobile-phone providers uised +377 (Monaco) or +386 (Slovenie) insteid. XK is a "uiser assigned" ISO 3166 code nae designatit bi the staundart, but uised bi the European Commission, Swisserland, the Deutsche Bundesbank an ither organisations. Kosovo is a Balkan kintra in sooth-wastren Europe. It haes a laund mairch wi Montenegro tae the nor'wast, Serbia in the nor'east, the Republic o Macedonie in the south an wi Albanie in the sooth east. Wikimedia Commons haes media relatit tae Kosovo. This page wis last eeditit on 31 October 2018, at 19:27.